It was a dark and stormy night in the town of Menasha, Wis. last Saturday, quiet except for the relentless patter of rain, an occasional crack of thunder - and the desperate cries of a baby deer in dire need of a helping hand. While folks were staying cozy indoors at home that evening, police officers John Swenson and Mike Weinberger were on the job making sure that everyone was safe and sound. 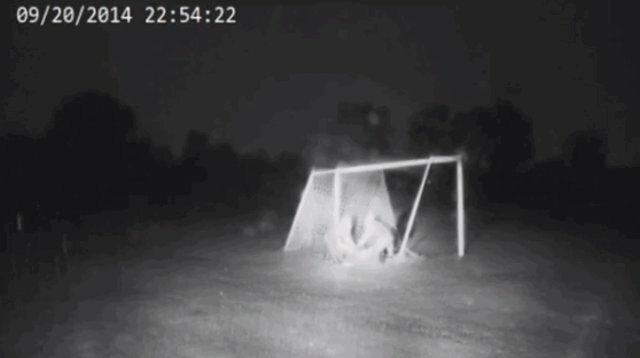 So, when a dispatch came in that one of the town's non-human residents, a fawn, had become hopelessly tangled in a soccer net at a nearby elementary school, they went above and beyond in their duty to protect and serve. Chances are no one would have faulted the officers had they waited for the rain to ease up some before responding to that late-night call, but as Fox 11 News reports, they didn't hesitate to offer assistance to the helpless animal. 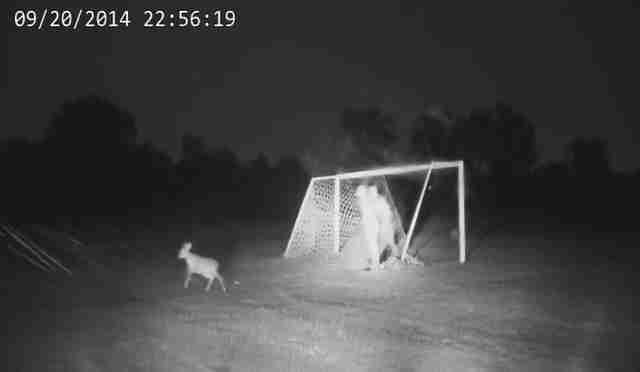 Footage from the heartwarming rescue, captured on the police cruiser's dashboard camera, shows the officers reassuring the fawn as they untangle her from the net. Though the gloomy scene might look a bit reminiscent of some 1950's film noir, the happy ending was decidedly Disney. "Bambi went home," the officers reported back on the radio after a job well done.